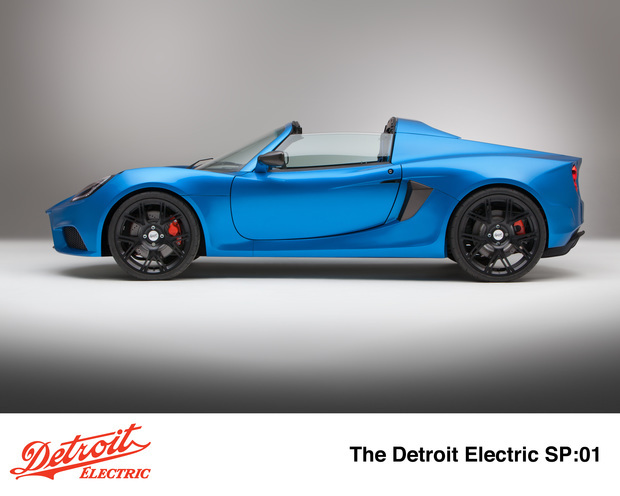 Coverage of Detroit Electric's electric sportscar, the SP:01, is portrayed as if the SP:01 is the fastest electric vehicle on the planet. At 155 miles/hr top speed it's a fast electric vehicle, but it's not the fastest electric vehicle in existence. It isn't even the fastest production electric vehicle in existence. 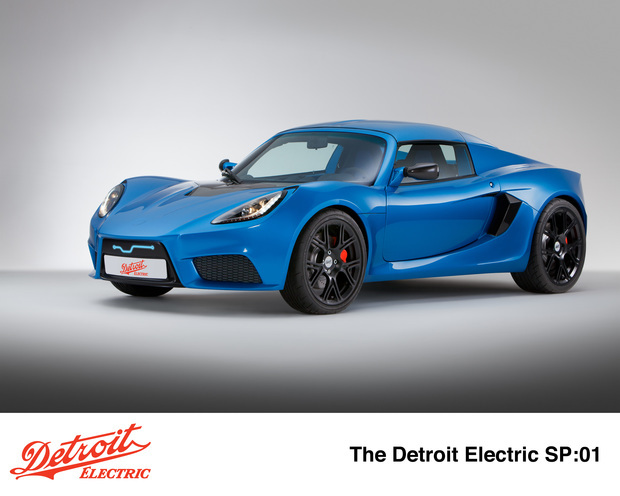 Detroit Electric is showing the car at the Shanghai Auto Show this week, making it the first public unveiling of the SP:01. The company has existed for about 5 years originally as a joint venture between Albert Lam and ZAP, but the ZAP connection has been severed since 2009. Lam was formerly a top executive at Lotus Engineering, so if you're scratching your head muttering "doesn't that look like ... " there's a reason for this. 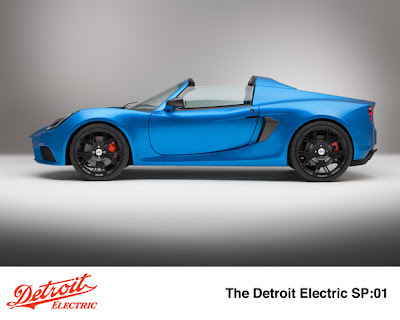 The car is built on a platform provided by an unnamed automaker, and Detroit Electric adds an electric drive train, carbon fiber body, and passenger compartment stuff, to make a complete car. I'm pretty confident that unnamed automaker is Lotus, FWIW. I wrote up coverage of the SP:01 at PlugInCars.com. The specs are: The SP:01 is a rear-wheel drive car, with a compact mid-mounted 201-bhp electric motor (delivering 166 lb-ft of torque), based on a lightweight bonded all-aluminum platform and all new carbon-fiber bodywork. The SP:01 weighs 2,354 pounds, and has specialized performance-tuned suspension, steering and brake systems. The combination provides a 155 mile an hour top speed, while zipping from zero to 60 m.ph. in 3.7 seconds. 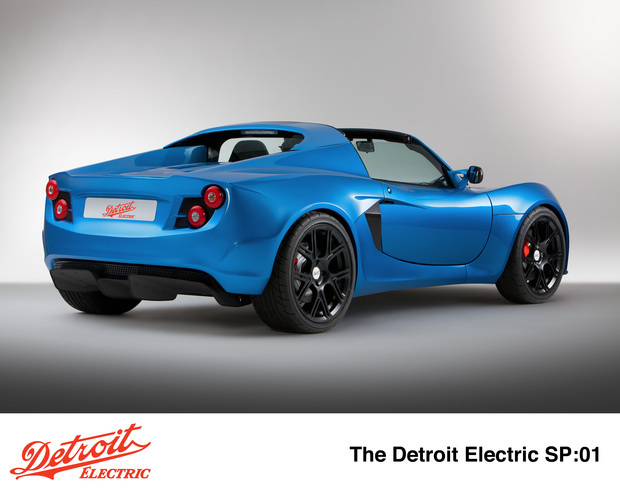 What I want to cover here is whether the SP:01 is the fastest electric vehicle or what. For the record, Detroit Electric describes it as the fastest production electric car. The problem is that some of the news coverage is not being as careful in the phrasing It's faster than the Tesla Model S, so yes it is the fastest production electric car. The fastest production electric vehicle is the Lightning Motorcycles electric superbike. This bike is race tested and holds the land speed record for electric motorcycles, at 215 miles/hr. And it is in production, in small quantities. The next fastest electric car in production is the Tesla Roadster and Tesla Model S, of course.